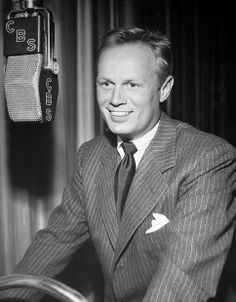 Richard Widmark made his debut as a radio actor in 1938 on Aunt Jenny's Real Life Stories. In 1941 and 1942, he was heard daily on the Mutual Broadcasting System in the title role of the daytime serial Front Page Farrell, introduced each afternoon as "the exciting, unforgettable radio drama... the story of a crack newspaperman and his wife, the story of David and Sally Farrell." Farrell was a top reporter for the Brooklyn Eagle. When the series moved to NBC, Widmark turned the role over Staats Cotsworth. During the 1940s, Widmark was also heard on such network radio programs as Gang Busters, Inner Sanctum Mysteries, Joyce Jordan, M.D., Molle Mystery Theater, Suspense and Ethel and Albert. In 1952 he portrayed Cincinnatus Shryock in an episode of "Cavalcade of America" titled "Adventure on the Kentucky." He returned to radio drama decades later, performing on CBS Radio Mystery Theater (1974–82), and was also one of the five hosts on Sears Radio Theater (as the Friday "adventure night" host) from 1979-81. VIDEO: Front Page Farrell - Leslie Plans To Resume Working Front Page Farrell ran from 1941 to 1954 and featured the story of David Farrell, a handsome star reporter for a top New York newspaper, "The Brooklyn Eagle. The Farrells go on reporting assignments and solve cases along the way. The show was originally geared towards a male audience but it appealed to female listeners because it was an unforgettable story of marriage and a newspaper office, the story of a dashing young star reporter on one of New York’s greatest newspapers, and the girl he marries on impulse, to save her from throwing herself away on a rich man twice her age. Richard Widmark stars as a good-looking reporter named David Farrell who works for a prestigious New York newspaper, "The Brooklyn Eagle". Florence Williams played his wife Sally Farrell.